PirateBallerina is in possession of evidence that shows Ward Churchill may have appropriated the military experience of someone else and claimed it as his own. During a 1993 interview, Churchill gave supposed recollections of his actions and thoughts from his time in Vietnam that our evidence shows were in fact stolen from a quote by an anonymous soldier in an essay published a year earlier by a different author. What is then, one of the most difficult moments or situation? Waking up in the morning in what was called Indian Country in 1968 and finding out I was a member of the 7th Calvary (sic). Not literally, there was a 7th Calvary (sic). In the morning in what they called Indian Country, this is what hostile territory is called in Viet Nam, yaa know, I figured I was a member of the Calvary (sic) and not the Indians. That experience kind of changed my life. I decided to get on the right side, which isn't with the Calvary (sic), it wasn't with the United States. And just about everything I've done since then was drawn from that experience and all kinds of things have added on. But everything has been very, I can make sense of it, [i]t's been very consistent in that way. Then, I'm always engaged, I never stop, I'm never unplugged. This tale seems highly unlikely, since military records indicate Churchill was trained as a truck driver and projectionist in the Army in 1966-68, and there is no evidence that during his 11-month stay in Vietnam he saw battle at all. Three, Tom Holm has confirmed in private correspondence with PB that Churchill was in fact instrumental in getting Holm's chapter into the book, and had read it even before publication. So there is little doubt that, at least a year before the Rave interview (and given publishing lead-times, probably closer to two years), Churchill had seen and was familiar with the quote given by the anonymous veteran. Rave Interview: "[...]Waking up in the morning in what was called Indian Country[...]"
Holm Excerpt: "[...]run missions into what everybody called "Indian country." That’s what they called enemy territory... 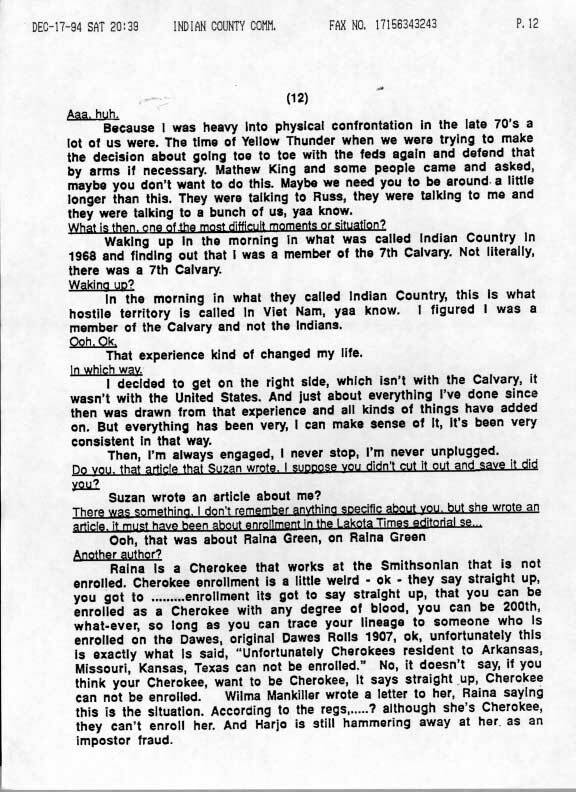 I woke up one morning[...]"
Rave Interview: "[...]I figured I was a member of the Calvary (sic) and not the Indians.[...]" Holm Excerpt: "[...]and realized that instead of being a warrior like Crazy Horse, I was a scout used by the army to track him down.[...]" Rave Interview: "[...]I decided to get on the right side, which isn't with the Calvary (sic), it wasn't with the United States.[...]" Holm Excerpt: "[...]I was fighting the wrong people, pure and simple, and I’ve never gotten over it."[...]" Adding to this strange "coincidence" is the fact that three years after the Rave interview, in 1996, Tom Holm published Strong Hearts, Wounded Souls, Native American Veterans of the Vietnam War, a much larger collection of his interviews with Indian veterans (including the "Creek/Cherokee veteran"), and that Ward Churchill reviewed the book the following year (1997) in Z Magazine. In Churchill's review, he makes the bizarre blunder of citing and quoting from the exact same anonymous veteran's quote - perhaps temporarily forgetting that he had himself appropriated that veteran's identity as his own in an earlier interview. There's only one possible way that Churchill could attempt to explain away the identity theft and fraud represented by this evidence, and that is for him to claim that he himself was in fact the anonymous veteran who had given the original quote to Tom Holm. On the other hand, if he is not the quoted veteran, then Churchill has clearly stolen the experience and memories of the anonymous soldier to enhance his own back-story. So, is Churchill padding his military history with a reminiscence he lifted from someone else? Or is he engaging in a bit of self-referential whimsy that is itself based on a lie he told a fellow author under cover of anonymity? In either case, Churchill has shown his utter inability to tell the unvarnished truth. Like a black pearl, once his accreted layers of lies and fraud is chipped away, what is left? One more piece of business: We challenge Ward Churchill to come forward and either confirm that he was the "anonymous soldier" or admit that he appropriated the soldier's story. 1. In a 1995 interview with WBAI radio, Churchill reprised his story: "Well in 1969, after I came out of the army, I was a draftee and sent to Vietnam. I came back from that a little bit irritated of the posture of my government. I'm also an American Indian and I was sent to Southeast Asia to uphold a treaty which did not require that I be there. I considered it a fact before I even left there that while I was over there doing that, the United States was in the process of standing in complete violation of 371 odd treaties that were on record with my people or related peoples right here in North America. If we're going to be busy enforcing treaties, it ought to be home, not over there." Note Churchill's reference to "371 odd treaties" which corresponds to the anonymous soldier's "[...]violating its treaty commitments to my own people and about 300 other Indian nations[...]"
"They kept running me on point during the day, and putting me out on listening posts at night. The company I was with, 4th Division, you know, it was all draftees who didn't have a clue what to do if we got hit. So, I knew I was going to die the minute we made serious contact [with enemy forces]. I'd be out there all by myself, and there'd be nobody to back me up. So I volunteered to run LRRP missions. At least then I knew the people around me knew what they were doin'. Besides, in the LRRPs our objective was to avoid contact, not seek it out. It was scary business, but all things considered I figured my best shot at living through Vietnam was to be a LRRP. Crazy, ain't it?" As noted in our article, Churchill has asserted that he was an LRRP. While not proof positive that Churchill appropriated the Creek/Cherokee veteran's story, this does seem to reduce the probability of a third explanation some have offered for the uncanny similarities between Churchill's story and the anonymous Creek/Cherokee's, namely: coincidence of experience. On the other hand, the case is now stronger that Churchill himself supplied the "Creek/Cherokee veteran" quotes--but that would seem to entail some scholarly chicanery on Holm's part, as well.